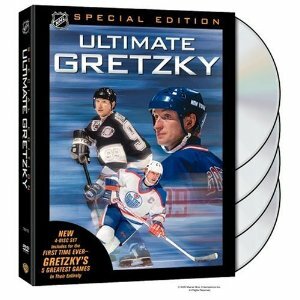 I watched the documentary portion of Ultimate Gretzky (Special Edition) last night. A first class, amazing presentation - a must have for any Gretzky fan or for any newer fan wanting to learn more about the greatest player the game has ever seen. Philadelphia Flyers at Edmonton Oilers, Northlands Coliseum, December 30, 1981 - Complete Original Broadcast (minus commercials & intermissions) - Wayne Gretzky scores 5 goals to complete the record-shattering achievement of 50 goals in 39 games. We're not sure who's calling the play-by-play or what TV network the broadcast is from, but the color commentator is none other than Don Cherry! 1983 NHL All-Star Game, Nassau Coliseum, February 8, 1983 - Complete Orignal Broadcast (minus commercials & intermissions) - Wayne comes alive with four third-period goals to earn his first All-Star Game MVP award. 1984 Stanley Cup Finals Game 5, New York Islanders at Edmonton Oilers, Northlands Coliseum, May 19, 1984 - Complete Original Broadcast (minus commercials & intermissions) - Gretzky & company taste sweet revenge against the Islanders, completing a 4-1 series victory and skating with the Stanley Cup for the first time ever. 1993 Western Conference Finals Game 7, Los Angeles Kings at Toronto Maple Leafs, Maple Leaf Gardens, May 29, 1993 - Complete Original Broadcast (minus commercials & intermissions) - Wayne's hat trick does the trick as the Kings upset the Leafs in Toronto to move on to the Stanley Cup Finals. Vancouver Canucks at Los Angeles Kings, Great Western Forum, March 23, 1994 - Complete Original Broadcast (minus commercials & intermissions) - Wayne passes Gordie Howe on the all-time scoring list by recording his 802nd career goal. Like I said, this a must have for any Gretzky fan. And the best part? It is surprisingly inexpensive!